Although it was built over four decades ago, Lowe's Motor Speedway at Charlotte is still known by many as the "Mecca of Motorsports." The largest sports facility in the Southeast, Lowe's Motor Speedway has 167,000 seats, including 121 executive suites, and capacity for nearly 50,000 more spectators in the infield area. One of the busiest facilities in the country, the speedway hosts three NASCAR Winston Cup events each year, including The Winston (NASCAR's all-star race), the Coca-Cola 600 (the fourth largest single-day paid sporting event in the country) and the October running of the UAW-GM Quality 500, which is usually pivotal in the season-long battle for the NASCAR Winston Cup Championship. Other major events include NASCAR Busch Series Grand National Division races in May and October, two Food Lion AutoFairs, the GoodGuys Southeastern Rod and Custom Nationals and a nationally-televised series for Legends Cars. Lowe's Motor Speedway at Charlotte was the first superspeedway to host night racing in 1992 and was also the first sports facility in America to offer year-round living accommodations when it released 40 condominiums for sale high above Turn One in 1984. Today the speedway has 52 condominiums and is home to The Speedway Club, which offers dining members a spectacular view of the 1.5-mile oval from a luxurious environment. In February 1999 the speedway became the first motorsports facility to sell its naming rights to Lowe's Home Improvement Warehouse. The speedway's Winston Gift Shop offers guided tours of the speedway (including a lap around the high-banked oval) year-round. The 2,000-acre facility serves as a backdrop for numerous TV commercials, motion picture sets, private testing, driving schools and a long list of events that fill more than 280 days of the track calendar yearly. Lowe's Motor Speedway at Charlotte is an active supporter of Speedway Children's Charities. Location: On Concord Parkway South (U.S. Hwy. 29), 12 miles north of Charlotte in Concord, N.C. Accessible by I-85, I-77 and I-40. Near Charlotte/Douglas International Airport. 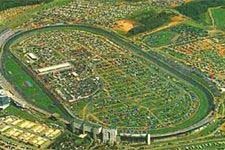 Concord, N.C. - The N.C. Department of Transportation plans to spend $3.5 million in federal stimulus dollars for road work by Lowe's Motor Speedway in Concord. The project is part of $75 million in road improvements Bruton Smith asked for two years ago in return for keeping his racetrack in Concord. The city of Concord and Cabarrus County agreed that Smith would pay for the work and be reimbursed years later. Morehead Road, which runs along the south side of the track, would be widened and moved away from the speedway. The 3/4-mile project isn't needed to handle day-to-day traffic, but realigning the road will allow the speedway to place vendors adjacent to the track during race weekends. Pedestrians won't have to cross the road as often, making the area safer. "The speedway didn't necessarily ask for this," said N.C. DOT division engineer Barry Moose, who oversees state road projects in Cabarrus and much of the Charlotte area. "Since it was Cabarrus and Rowan's No. 1 project, I felt like it was OK to fund it." Moose said he had done preliminary design work on the Morehead realignment before Smith and Cabarrus officials began negotiating over the future of the speedway. In late 2007, Smith threatened to move his speedway unless the city of Concord allowed him to build a nearby drag strip off Bruton Smith Boulevard. After a public feud, Smith and the city and county struck a deal to keep the track in Concord. As part of the deal, Smith would front the cost of $75 million in road improvements. That included moving Morehead Road, extending George Liles Parkway from Weddington Road to U.S. 29, and widening Bruton Smith Boulevard. The parties are now negotiating over how long they have to repay Smith. Smith had asked for the money back in three to five years, instead of several decades. Joe Wilson, Concord's transportation director, said the Morehead Road relocation wasn't on a priority list because it's a relatively new project. It also qualified for stimulus funding because it could be built quickly, and he said building the new road would create more jobs than repaving existing highways. Home improvement retailer Lowe's says it won't extend its naming rights deal with the Charlotte, N.C., track that carries its name. The deal expires at the end of this year and the track is expected to revert to its former name, Charlotte Motor Speedway.